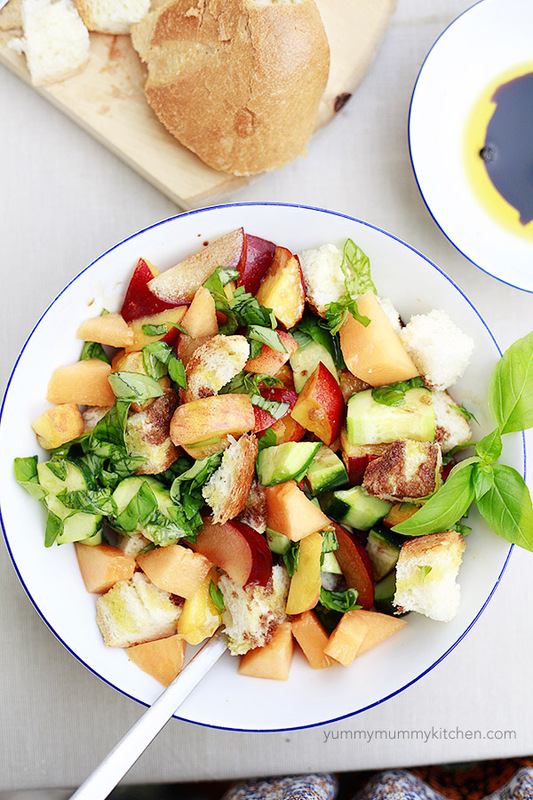 Stone fruit panzanella with Italian bread, fresh basil, cucumber, and balsamic is the marriage of several of Italy’s best summer ingredients all in one bowl. Ciao Amici! We are currently on vacation in Italy. One of the things I love most about Italia is the food. You’re shocked, I’m sure. Almost every morning since we arrived, I’ve walked a mile down the road from the rustic stone house in the hills where we are staying into town. I’ve found my favorite bakery, where I always pick up a loaf of fresh crusty ciabatta. Next I visit the fruit/veggie/pasta/wine guy across the cobblestone road. Only (and always) stopping for a cup of gelato. We’ve spent a day in Venice, tried some local restaurants, and climbed to the top of castles. But mostly we’ve just enjoyed the simple life – relaxing by the pool, cooking and eating. Hearing nothing but church bells and wild turkeys. La dolce vita. 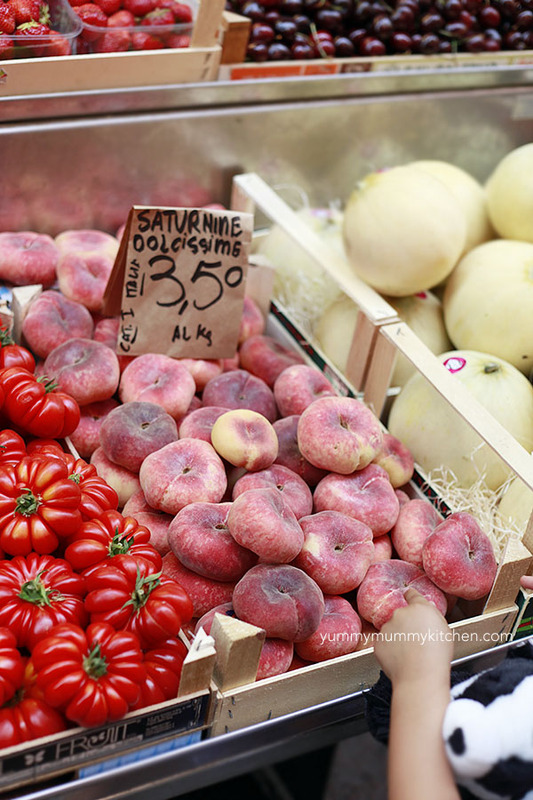 The fresh produce in Italy is incredible. None of the rock-hard cold peaches that take weeks to ripen like we often find in the US. We have been going through bunches and bunches of fresh apricots, peaches, and nectarines here. They are the sweetest we’ve ever tasted. So one night I threw together a traditional Italian salad – panzanellla – but switched it up by using stone fruit instead of tomatoes. Like ribolita, panzanella is a great way to use up leftover bread. 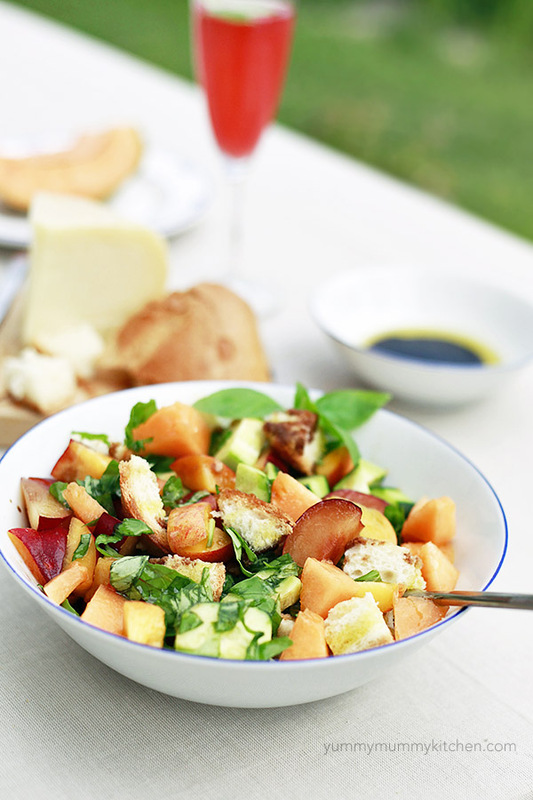 Fresh summer fruit makes this salad refreshing and light. I added some cubed cantaloupe too. Tomato would be great in here as well as the fruit, so feel free to add it in! And since it is vacation, I made myself a blood orange basil cocktail you have got to try. 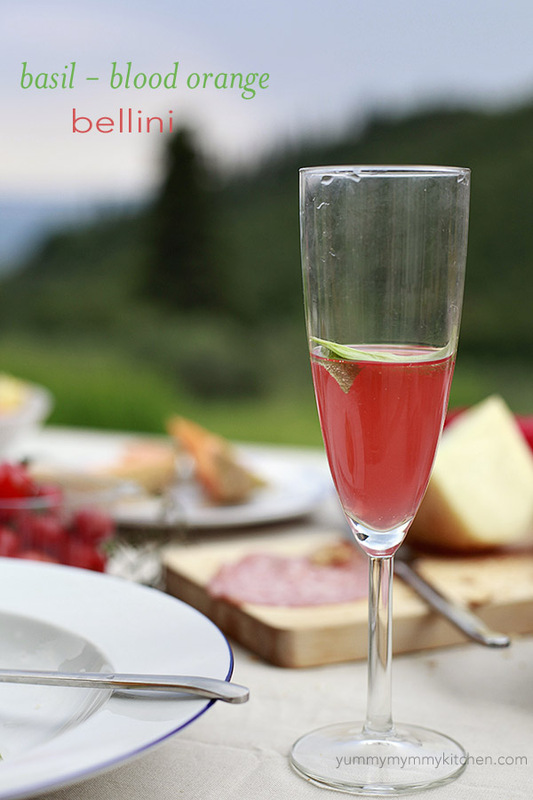 Just squeeze some fresh blood orange juice into some prosecco and add some torn basil. Salute! Stone fruit panzanella with Italian bread, fresh basil, cucumber, and balsamic is the marriage of several of Italy's best summer ingredients all in one bowl. 1. In a salad bowl, toss together the fruit, cucumber, onion, and bread. Dress with oil, vinegar, and basil. Traditionally, panzanella is allowed to sit for awhile until the bread becomes very soft - cover with plastic wrap and refrigerate a few hours until ready to eat, or enjoy right away.